Leigh Centurions confirmed the signing of the vastly experienced back row forward Danny Tickle from Castleford Tigers just before the transfer deadline and he made his debut off the bench against Dewsbury at LSV. A product of the famous Golborne Parkside community club, Tickle’s first professional club was Halifax, making his Super League debut as a teenager in 2000. He moved on to Wigan in 2002 and then spent seven seasons with Hull between 2007-13 before two years at Widnes Vikings in 2014-15. He joined Castleford in April 2016. 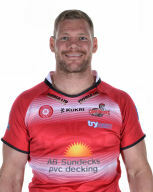 Few players can match Tickle’s remarkable consistency and durability in topflight Rugby League and he is also recognised as a top class goal-kicker and regular try-scorer. He has made a total of 378 Super League appearances comprising 42 for Halifax, 130 for Wigan, 164 for Hull, 34 for Widnes and 8 for Castleford, scoring a total of 92 tries and kicking 912 goals. Overall, including four appearances for England he has made just over 400 senior appearances and scored 96 career tries and kicked 1012 goals. In his last England appearance against Wales at Bridgend in 2009 Micky Higham was a team-mate. Tickle won a European Championship winners medal with England in 2003 and has also played in the 2003 Grand Final and in the 2004 and 2013 Challenge Cup finals.